On behalf of our client, Jiangxi Air, we are pleased to accept applications for Direct Entry B737NG/EFIS Captains, with a variety of rostering options. Jiangxi Air is an emerging airline in the Chinese air transport market. It began official passenger operations on January 29, 2016. Jiangxi Air is a subsidiary of Xiamen Air. It is jointly owned by Xiamen Air (60%) and Jiangxi Aviation (40%). Jiangxi Air operates from its main base at Nanchang Changbei International Airport in Nanchang, Jiangxi Province. 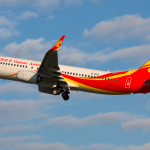 Jiangxi Air currently has five Boeing 737-800 aircraft in the company fleet, with two B737’s joining the fleet in 2017. The fleet size is expected to reach 20 aircraft by the end of 2020. In the next 3 years, Jiangxi Air will launch international routes to Hong Kong, Macau, Taiwan and other Southeast Asian and Northeast Asian destinations. Jiangxi Air offer residential employment and six commuting options, from 19 days on/11 days off to 42 days on/18 days off. Jiangxi Airlines will contact Flightdeck to advise the outcome of the screening process and to request your availability to attend the next stage of process. The final stage of the employment process is a CAAC Simulator Check, conducted in Xiamen, this takes approximately one week.